A self-fusing, silicone repair product with infinite uses. Resists fuels, oil, acids, solvents, salt water, road salt and UV rays.For repairing leaks on plumbing and hoses in a flash. It can be used to insulate electrical wiring and it can withstand a constant working temperature of 200°C. Simply stretch and wrap for permanent seal. 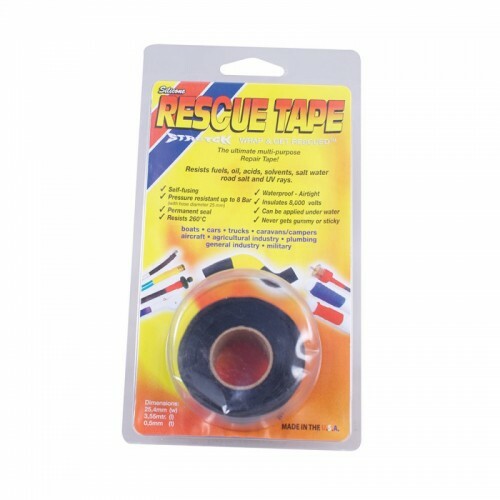 Suitable for emergency hose repair, pipe and plumbing repair, electrical insulation, wiring harnesses, corrosion protection, sealing connections & fittings, waterproofing, rigging applications, whipping rope ends, emergency O-rings and seals, tool handles and grips and much more! Merchandise available: countertop dispenser, clip strips, dvd, posters and flyers.